…to bring you an important announcement from our sponsors. BEN AND I GOT ENGAGED THIS WEEKEND! 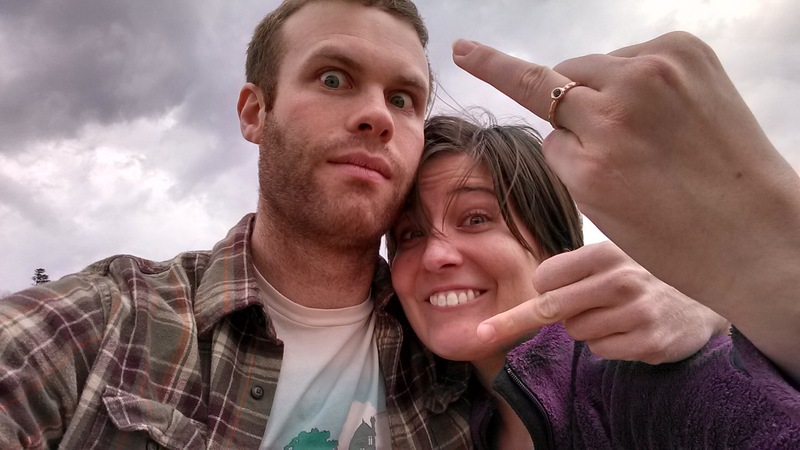 Yes, this is the photo we used to announce our engagement to Facebook and the world. Yes, we are super classy. I don’t want to get too gushy about it, but suffice to say it was a total surprise and I couldn’t be happier. We’ve been together almost 6 years now, and I’m just so excited to start this next phase of our lives together. We did a LOT of celebrating this weekend, so a few things got derailed, but I’ll cover that in my Manic Monday post, coming at you later this afternoon. I would also like to state for the record: I think it’s hilarious and awful how many times we’ve already been asked if we’ve set a date. Umm, hi, this just happened. We’re still in the process of telling people and celebrating. We are definitely not organized enough to have set a date yet. Seriously, someone asked me this mere hours after the proposal. Craziness. Did anything exciting happen to you this weekend? CONGRATULFREAKINGLATIONS!! I love the picture 😀 And isn’t it hilarious how much people jump the gun and start asking whenwhenwhen? Then it will be where, what your dress looks like… never ends. Just enjoy the excitement and each other! Unless you are getting married in a month, I say give yourself at least a week. My husband and I were engaged for a year and a half (we got engaged at Christmas and waited until May a year after) and so we figured out the general time and then told people that rotations and a graduate thesis took priority. That helped. But after, yeesh. Ha! That picture is awesome 😀 Congratulations!!! yayyyy! congrats! have you set a date? jk 😉 it only gets worse lol. on your wedding day people will ask when you’re gonna start with the babies! lol. Oh god, can we not have the baby discussion?! Lol, thanks! Best picture ever. Please use that on your wedding invitations!! Thank you! We’re so pumped. So… did you set a date? … KIDDING!!! Thank you! It’s very “us.” I’m already bracing myself for the baby question… Oy! Thank you! It’s really exciting and a little overwhelming. Thank goodness I’ve got my mom, sisters, and lots of friends to help! Thank you! We’re really excited 🙂 And we’re also the silly sort of people who would celebrate our “engage-aversary” too.